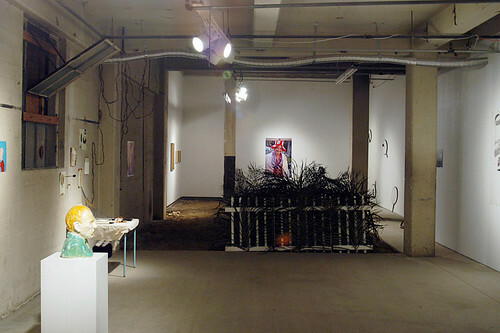 “Open Storage” is an invitation for artists to use D-Block Projects as storage facility and exhibition space for artworks that were being stored in their studios and out of view of the public’s eye. This exhibition draws upon the “open storage” trend found at some museums where storage facilities are opened to the public to see the otherwise private existence of stored art. 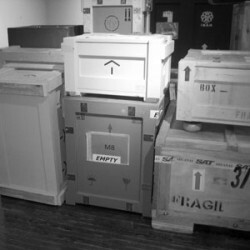 The open storage experience removes the historical context of works and instead displays work based on the size, logistics of storage and the availability of space. The exhibition “Open Storage” aims to create a heterogeneous display of artworks that have an intended random association to each other which require the viewer to create a narrative or framework outside of the usual way of viewing art. Participating Artists: Celine Bayla, Ed Bopp, Jeff Chabot, Ethan Crenson, Emmanuel Crespo, Carla Danes, Chris Danes, Rashell George, Ed Gomez, Fidel Hernandez, Luis G. Hernandez, Ryan Lamb, Ivan Limas, Albert Lopez, Matt MacFarland, Caroline Maxwell, Chris Morales, Mike Rogers, Steve Schmidt, Francesco X. Siqueiros, JJ Stevens, Jason Wallace Triefenbach, and Yalda Yazdanpanah.